Landlords - are you ready for new electrical safety laws in April? Landlords must ensure the electrical safety of tenanted properties before the likely introduction of new legislation in April. That is the warning from Daniel Dowling, legal and compliance director at national estate agents Leaders, who says the Housing and Planning Act 2016 has created the legislative power to pass new rules and regulations in this area. Daniel explains: “The government's recent white paper on housing outlines its intention to tackle the issue of electrical safety in rented properties and to raise standards throughout the sector. 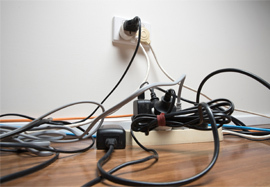 "So although the exact details are yet to be released, we believe that all tenanted properties will soon be required to have an electrical installation check, while all electrical appliances will have to undergo a PAT test. “We anticipate that, from April 2017, all properties placed on the lettings market will need evidence that they meet the latest electrical safety standards and that all appliances are safe. Electrical safety checks and PAT tests can only be carried out by qualified electricians, who will compile a report and may also be required to carry out any repairs or maintenance work. Daniel adds: “Providing this legislation is implemented in April, qualified electricians will be at a premium as landlords across the country respond by having the relevant checks completed. “To avoid the possibility of a void period being caused by a delay in waiting for a busy electrician to find the time to assess a property in March or April, landlords should act now and ensure their properties meet the required standards well in advance of the rules being introduced.